Registration is now closed for this event. Stay tuned for details about our next Books n' Brunch, which is coming up in February. 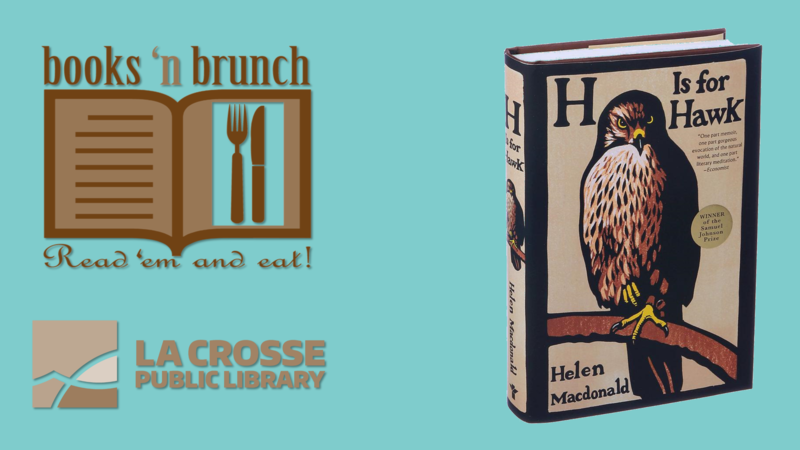 Join us for Books 'n Brunch, our quarterly brunch and book discussion club. Free! Registration is required. Seating is limited. This event will be held at the Black River Beach Neighborhood Center, 1433 Rose Street. In October, we'll be discussing H is for Hawk by Helen Macdonald. This memoir tells the story of a woman's journey adopting and raising one of natures most vicious predators. Fierce and feral, the hawk's temperament mirrors the author's own state of grief after her father's death, and together raptor and human discover the pain and beauty of being alive. We'll be joined by the Coulee Wildlife Rehab and one of their live Red-tailed Hawks. To questions, please contact Mary Dunn at (608) 789-7145 or mdunn@lacrosselibrary.org. Books 'n Brunch is paid for with a grant from the Gertrude Salzer Gordon Trust.